Haverford Healthcare Advisors is a specialized financial consulting firm dedicated to serving the business valuation and transaction advisory needs of middle-market healthcare service companies. Founded in 1994 by Managing Directors Christopher Jahnle and Kirk A. Rebane, Haverford Healthcare Advisors provides deep healthcare industry expertise, market knowledge, and professional insight in delivering business valuation and transaction advisory services throughout the United States. Haverford Healthcare Advisors’ professionals have completed hundreds of transactions involving healthcare service companies located throughout the United States with valuations ranging from $2.0 million to $200 million. We seek to build client relationships based upon our honesty, integrity, accessibility, responsiveness, and our extensive industry and financial expertise. Haverford’s professionals have completed over two thousand independent business valuation projects in connection with mergers and acquisitions, joint ventures, shareholder matters, litigation, tax and financial reporting requirements, as well as regulatory issues relating to physician compensation and healthcare service agreements. Our opinions have been relied upon by healthcare executives and attorneys for over 30 years. Medical Anesthesia Consultants, LLC has been acquired by American Anesthesiology, a subsidiary of MEDNAX, Inc. Haverford Healthcare Advisors initiated this transaction and served as exclusive financial advisor to Medical Anesthesia Consultants, LLC of Florence, South Carolina. Northwest Anesthesia, PA has been acquired by American Anesthesiology, a subsidiary of MEDNAX, Inc. Haverford Healthcare Advisors initiated this transaction and served as exclusive financial advisor to Northwest Anesthesia, PA of Minneapolis, Minnesota. Pathology Associates of Sebring was acquired by Aurora Diagnostics, LLC. Haverford Healthcare Advisors initiated this transaction and served as exclusive financial advisor to Aurora Diagnostics LLC in connection with this transaction. Henry Mayo Newhall Hospital's Outreach Laboratory Operations are acquired by LabCorp. Haverford Healthcare Advisors initiated this transaction and acted as exclusive financial advisor to United WestLabs, Inc. and Henry Mayo Newhall Hospital. Nebraska LabLinc, L.L.C. has been acquired by LabCorp. Haverford Healthcare Advisors initiated this transaction and served as exclusive financial advisor to Nebraska LabLinc of Lincoln, Nebraska. Pacific Pathology Associates was acquired by Aurora Diagnostics, LLC. Haverford Healthcare Advisors initiated this transaction and served as exclusive financial advisor to Aurora Diagnostics LLC in connection with this transaction. Anesthesia Care Group, PC has been acquired by North American Partners in Anesthesia (NAPA). Haverford Healthcare initiated this transaction and acted as exclusive financial advisor to Anesthesia Care Group, PC of Manchester, New Hampshire. Anesthesia Associates of York and Anesthesia Associates of Laurel, LLC have been acquired by PhyMed Healthcare Group. Haverford Healthcare initiated this transaction and acted as exclusive financial advisor to Anesthesia Associates of York, of York, Pennsylvania, and Anesthesia Associates of Laurel, LLC, of Laurel, Maryland. Consultants in Laboratory Medicine of Greater Toledo, Inc. was acquired by Aurora Diagnostics, LLC. Haverford Healthcare Advisors initiated this transaction and acted as financial advisor to Aurora Diagnostics, LLC. Millennium Anesthesia Care has been acquired by American Anesthesiology, a subsidiary of MEDNAX, Inc. Haverford Healthcare Advisors initiated this transaction and acted as exclusive financial advisor to Millennium Anesthesia Care of Tampa, Florida. Brazos Valley Pathology and Trinity Pathology Associates were acquired by Aurora Diagnostics, LLC. Haverford Healthcare Advisors initiated this transaction and served as exclusive financial advisor to Aurora Diagnostics, LLC. Atlantic Anesthesia, P.C. has been acquired by North American Partners in Anesthesia (NAPA). Haverford Healthcare Advisors initiated this transaction and served as exclusive financial advisor to Atlantic Anesthesia of New Hampshire. Certified Anesthesia Services has been acquired by TeamHealth. Haverford Healthcare Advisors initiated this transaction and served as exclusive financial advisor to Certified Anesthesia Services of Washington, D.C.
West Georgia Pathology, LLC was acquired by Aurora Diagnostics, LLC. Haverford Healthcare Advisors initiated this transaction and served as exclusive financial advisor to Aurora Diagnostics, LLC. Arizona Dermatopathology was acquired by Aurora Diagnostics, LLC. Haverford Healthcare Advisors initiated this transaction and served as exclusive financial advisor to Aurora Diagnostics, LLC. Newton Anesthesia Associates, LLC has been acquired by North American Partners in Anesthesia (NAPA). Haverford Healthcare Advisors initiated this transaction and acted as exclusive financial advisor to Newton Anesthesia Associates, LLC of Newton, New Jersey. Mid-Atlantic Pathology Services, Inc. was acquired by Aurora Diagnostics LLC. Haverford Healthcare Advisors initiated this transaction and served as exclusive financial advisor to Aurora Diagnostics LLC in connection with this transaction. Hallmark Pathology P.C. was acquired by Aurora Diagnostics LLC. Haverford Healthcare Advisors initiated this transaction and served as exclusive financial advisor to Aurora Diagnostics LLC in connection with this transaction. Fredericksburg Anesthesia Associates, Inc. has been acquired by American Anesthesiology, a subsidiary of MEDNAX, Inc. Haverford Healthcare Advisors initiated this transaction and acted as exclusive financial advisor to Fredericksburg Anesthesia Associates, Inc. of Fredericksburg, Virginia. PhyMED Announces the Acquisition of Lebanon Anesthesia Associates, Ltd. and Lebanon Pain Management Associates, Inc. Haverford Healthcare Advisors initiated this transaction and served as exclusive financial advisor to Lebanon Anesthesia Associates, Ltd. and Lebanon Pain Management Associates, Inc.
Norchem is acquired by Sterling Healthcare Holdings, LLC. Haverford Healthcare Advisors initiated this transaction and served as exclusive financial advisor to Norchem. United WestLabs' California and Nevada operations are acquired by Quest Diagnostics. Haverford Healthcare Advisors initiated this transaction and served as exclusive financial advisor to United WestLabs. Prospira PainCare announces the acquisition of The Pain Management Center. Haverford Healthcare Advisors initiated this transaction and served as exclusive financial advisor to The Pain Management Center. United WestLabs' Arizona operations are acquired by LabCorp. Haverford Healthcare Advisors initiated this transaction and served as exclusive financial advisor to United WestLabs. Austin Anesthesiology Group, L.L.P. 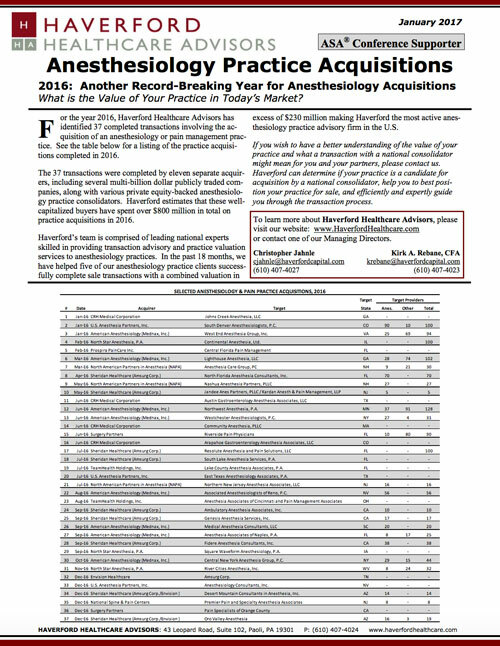 was acquired by American Anesthesiology, a division of MEDNAX, Inc. (NYSE: MD). Haverford Healthcare Advisors served as a co-advisor to Austin Anesthesiology Group, L.L.P. in connection with this transaction. Global Pathology Laboratory Services was acquired by Aurora Diagnostics LLC. Haverford Healthcare Advisors initiated this transaction and served as exclusive financial advisor to Aurora Diagnostics LLC in connection with this transaction. Valuation of Atlantic Diagnostic Laboratories, LLC, Bensalem, PA. Haverford Healthcare Advisors provided business valuation services for tax and financial planning purposes. Valuation of Vail Valley Surgery Center. Haverford Healthcare Advisors provided business valuation services for strategic planning purposes. DermPath New England, LLC was acquired by Aurora Diagnostics LLC. Haverford Healthcare Advisors initiated this transaction and served as exclusive financial advisor to Aurora Diagnostics LLC in connection with this transaction. ARIA Health. Valuation of medical records of a primary care practice. Haverford Healthcare Advisors provided valuation services in order to facilitate a transaction involving the acquisition of a primary care practice. Western Pathology Consultants, Ltd. was acquired by Aurora Diagnostics LLC. Haverford Healthcare Advisors initiated this transaction and served as exclusive financial advisor to Aurora Diagnostics LLC in connection with this transaction. Imaging 4 Life. Valuation of imaging center operations. Haverford Healthcare Advisors provided business valuation services for strategic planning purposes. Austin Pathology Associates, PA was acquired by Aurora Diagnostics LLC. Haverford Healthcare Advisors initiated this transaction and served as exclusive financial advisor to Aurora Diagnostics LLC in connection with this transaction. Moses Taylor Hospital divested its long term care operations. Haverford Healthcare Advisors initiated this transaction and served as exclusive financial advisor to Moses Taylor Hospital in connection with this transaction. Highland Dental Valuation of a dental practice company. Haverford Healthcare Advisors provided business valuation services for marital dissolution purposes.